I’m happy to announce that I will be restarting regular Rows Gardens in 2014. Puzzles will be available on a bi-weekly basis and will feature the kind of lively grids and clues that has been on display here since 2010. The delivery of said puzzles will change, however. The Rows Gardens offered will only be available via email delivery. In order to sign up for email delivery, you will need to purchase a subscription. How much is a subscription, you ask? You tell me! That’s right – I am offering Rows Garden subscriptions using a “name-your-price” model. I wrestled with price points long enough to make my head spin, so finally I decided to leave the pricing up to the solver. 26 puzzles in total will be offered on a bi-weekly basis in 2014. Puzzles will be sent early in the week, generally Mondays or Tuesdays. The first puzzle will be sent on Tuesday, January 7th, 2014. A subscription will get you all remaining puzzles in 2014 after the time you subscribe. That is, if you subscribe February 1st, you will receive all puzzles after that date but will miss out on the two January puzzles. So in order to get in on all the fun, be sure to sign up promptly. 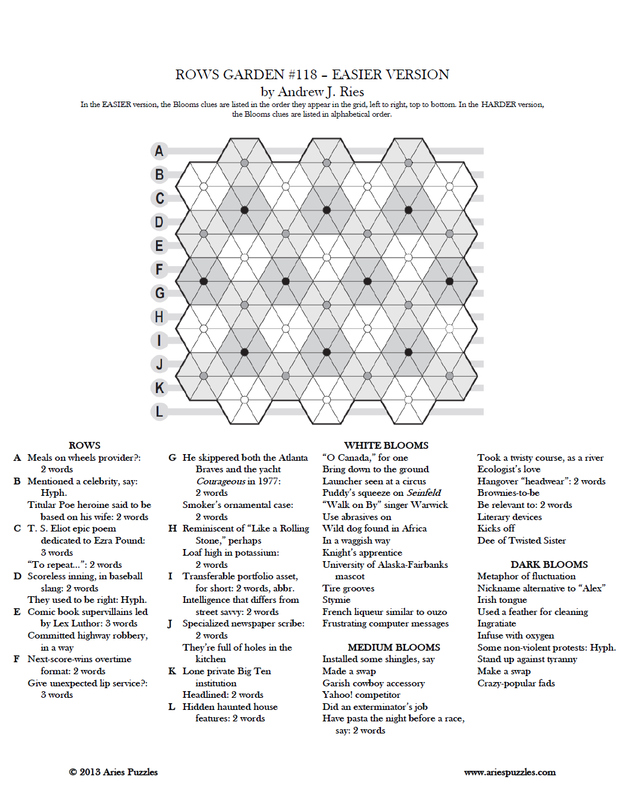 As opposed to AP.com-posted puzzles, I will not include an answer key along with the PDF version of the puzzle that will be emailed out to solvers. Instead, I will be posting the answers on the website one week after the puzzle was emailed, along with some brief commentary and other crossword-related linkage and such as I see fit. I hope that this provides a forum for solver feedback so please stop by the website regularly to check solutions and post your comments. All puzzles will be available in both the Easier or the Harder versions. Be sure to follow AP.com on Facebook. I'm also on Twitter now; you can follow me here. Allow me to give you an example of what to expect next year. Enjoy the puzzle below, the last of 118 free Rows Gardens that I've offered since 2010. Be prepared for a lively 2014 -- I already have a few grids ready to go and things are looking good. So sign up! Simply enter your price in the "Item Price" field on the left side of the Paypal screen. PS -- I am working on archiving the old freebies and importing them to the new site. Stay tuned as the weeks progress.